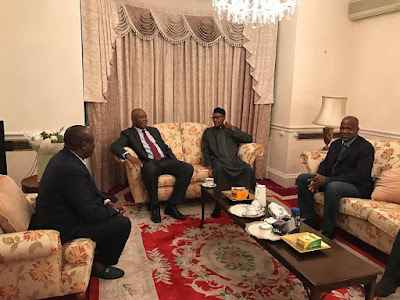 President Muhammadu Buhari Receives Senate President Bukola Saraki, Speaker House of Reps Yakubu Dogara and Senate Leader Ahmed Lawan who left Nigeria to visit him in London yesterday. President Buhari who took to Instagram Page to post a picture of himself and the visitors, wrote a note of thanks to all the Nigerian citizens for their prayers and good wishes and assures everyone that he's in good health condition and can't wait to return home. "Pleased to receive Senate President Bukola Saraki, Speaker House of Reps Yakubu Dogara and Senate Leader Ahmed Lawan tonight. We had a good time discussing. 2017 is going to be a year of mutual collaboration and support between all arms of government, for the benefit of all Nigerians. Let me also say that I'm immensely grateful to Nigerians, Christians and Muslims alike, for their prayers and kind wishes for my health." After the emergence of this picture, all citizens who were skeptical about the President's health and state of well been, are now assured that the President Buhari is hale and hearty. Pleased to receive Senate President Bukola Saraki, Speaker House of Reps Yakubu Dogara and Senate Leader Ahmed Lawan tonight. We had a good time discussing. 2017 is going to be a year of mutual collaboration and support between all arms of government, for the benefit of all Nigerians. Let me also say that I'm immensely grateful to Nigerians, Christians and Muslims alike, for their prayers and kind wishes for my health.